Our Stud: Landry A very sweet and mild mannered little guy. Loves all the girls and the girls love him. Landry ready for his bath. and has a pedigree to be proud of. He gets along with all the doggies here. 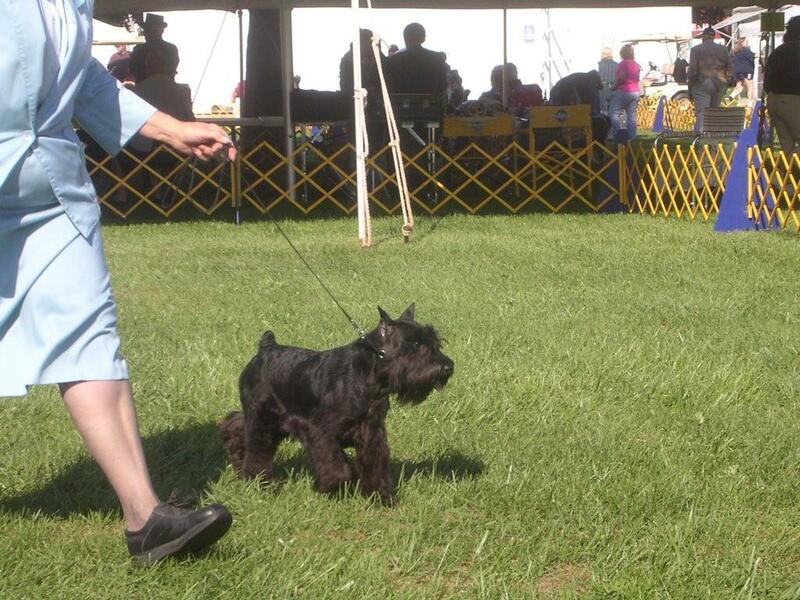 This Blk/Slvr gentleman came from a wonderful show breeder in Ohio. Boy, does he like the ladies! He's very sweet and does whatever I tell him to. He came with a very impressive pedigree. but I can't chance inbreeding nor do I want to line breed. 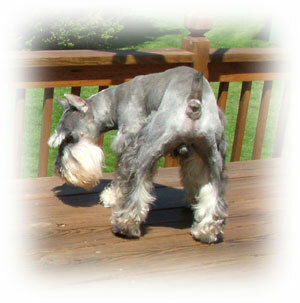 We do our very best to strive for healthy breeding. Bo Jackson....easy going, very cooperative and true to his master lives happily in Tennessee. My husband calls him Jackson and I call him Bo. Herbie is a wonderful little boy and loves being a pet. He loves to play keep away even when no one is paying attention. with kids and adults. Herbie has sired a lot of nice sweet puppies for us. Herbie has a big heart and a great pedigree. Herbie is the son of Blythewoods's Phantom Whisper. devoted and loves to be held. All his puppies turned out just as sweet as he is. Cooper wasn't much interested in getting his picture taken. Nose to the ground...just like a Schnauzer. Outlaw Jessie James who robbed my heart. J J for short. J.J. now lives in a pet home. He is the sire to 4 our our females. His breeding couldn't be better. I couldn't resist getting him for our kennel and now his good breeding will be carried on. Scout: Our Black Stud has been retired from Cathy's MiniPuppies. The picture to your left was taken on the first day Scout came to live with us. From the expression on his little face, I don't think he is too sure of being here. The next two pictures are of Scout all grown up. 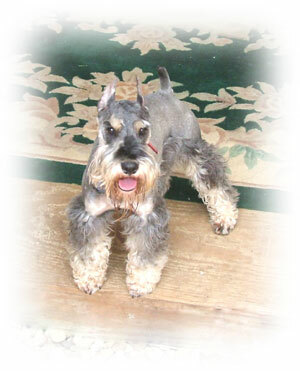 Scout has sired lots of our puppies here. Mickey: Our first Black stud. 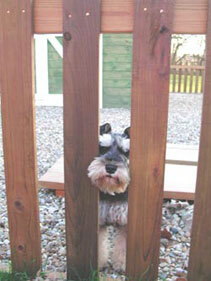 He is now retired and in a loving pet home. 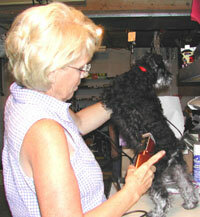 Mickey was the sire to some of Maggie's litters. Mickey and Miss Mini were best friends. Notice how Mickey has his paw over hers? Mickey never went anywhere without Miss Mini. 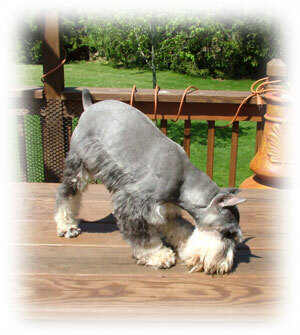 Tux was one of the sweetest Schnauzers we had here; He sired some beautiful puppies and will always have a special place in our heart. One of Mom's jobs is to keep us looking good. 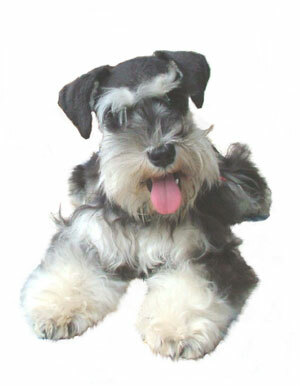 and interact with dog owners from around the world in our informative dog forums at I-Love-Dogs.com!